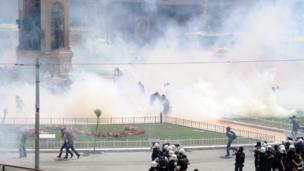 Pictures from Istanbul, where Turkish police use tear gas and water cannon against people protesting against plans for the redevelopment of a city centre park. 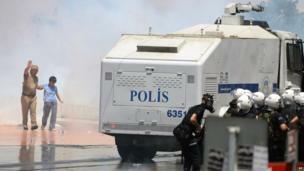 Turkish police have used tear gas and water cannon to disperse a sit-in against a regeneration project in Istanbul approved by the government. The controversial project is aimed at easing congestion around Taksim Square but also involves building a shopping mall over the popular Gezi Park - a rare green space in Istanbul's busy city centre. What started out as an environmental protest became anti-government in tone when police used tear gas against sleeping protesters overnight. 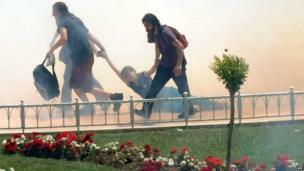 Clashes broke out in the heart of Istanbul's main shopping district on Friday tourists looked on. 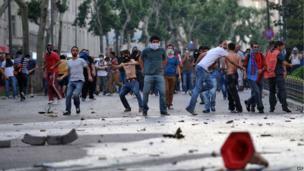 More protests are planned in at least three other large cities as the demonstration has widened into a broader protest against Prime Minister Recep Tayyip Erdogan and his Justice and Development Party. 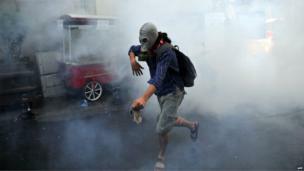 More than 60 people were reportedly detained by police during Friday's clashes. 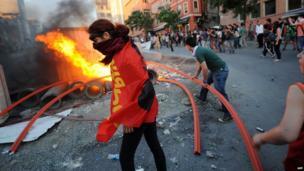 Earlier this month, riot police clashed with tens of thousands of people to prevent a May Day march in Istanbul.